So the last few times I have driven the route where I can go 20mph+ for an extended period of time, I have had the problem of the engine dying. I wind up letting the engine sit for a few minutes and then I have to use the choke to get it started again. Fortunately this occurs on my way home and I’m only about one mile from the house. When I get home, I pull the carb to find debris in the bottom of the fuel bowl. After the first time it happened, I replaced both fuel filters. When it happened the 2nd time, I knew the debris wasn’t coming in through the gas line. 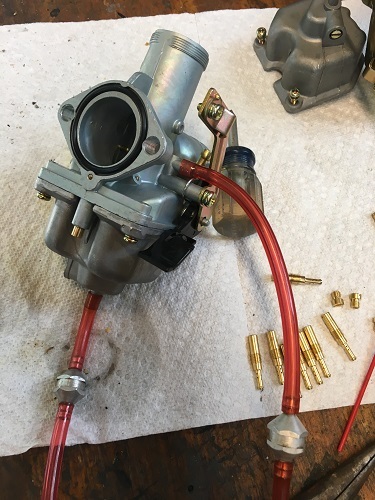 I find that there is a vent on the side of this carb. I added a line and installed a filter that I had used on my dirt bikes for the same purpose. I added a filter to the over flow line just because I have several of them. Another ride or two will tell me if this takes care of the problem. This entry was posted on September 19, 2018 by Harold Bawlzangya Racing. It was filed under golf cart .